A remarkable way to change the appearance of the chairs surrounding the dining table is to reupholster them. Regardless of the reason behind the need for your seat remodeling, you have to know that this is not a titanic task. You can get some brand new chairs in a couple of hours. Here is how to reupholster dining chairs the easiest way possible. You may tend to skip this step and go with the flow. Still, even though it seems easier at the beginning, it will prove to be difficult later. You will need the precise dimensions of the new fabric and cushion. Tip: do not change the cushion unless it is imperative. It can be time-consuming and, most probably, unnecessary. Unless the cushion is seriously deformed, do not change it. 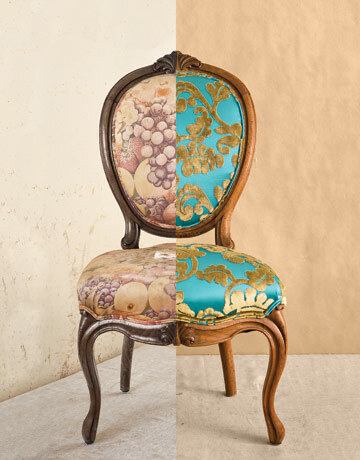 Reupholstering is an amazing way to bring old, worn out chairs back to life. Still, no matter what kind of chairs you own, you will need to clean the covers once in a while. Here are a few tips on how to do it quickly and easily. Next, there is nothing tricky about reupholstering dining chairs. First, you have to make sure that the fabric you choose is not just fashionable and appealing. Sure, the main idea is to breathe new life into your worn-out chairs, but do not neglect other aspects either, especially the strength. After all, this is a frequently used piece of furniture, so it needs a sturdy cover. You really need a material that is long-lasting and stain-resistant. You may also need foam or cotton to make the seats as comfortable as possible. After you have chosen the right material that fits your dining area and decided upon the cushions, it is time to get to work. Remove the seat pad from the bottom of the chair . Do that by removing the screws one by one. Then do the same thing with the old upholstery as gently as you can, using a screwdriver and side cutters to pull up each staple. Take a look at the wooden seat and see if you can reuse it. If it has visible cracks and/or is damaged in such a way that the seat cannot be recovered, change it. Here is where the right fabric measurements will be of great help. Make sure you trim the fabric so that it completely folds around the edges (about 5 inches on each side). Then place the material on a flat surface and start fixing it onto the seat pad. Firmly press the stapler against the fabric making sure it looks smooth, without clumps between the staples. Constantly check the material, delicately stretching it. Do the same with every side and trim any excessive, ‘leftover’ fabric. In the end, spray the seats with a stain protective solvent. Let it dry for a few hours and enjoy your new chairs!